Fragrances have the ability to affect one’s physical and psychological states. Think back to when you have noticed a change in your mood after smelling your favorite perfume or shower gel; chances are, the fragrance caused you to feel happy, energized, relaxed. Aromatherapy is the term used to describe the time-honored practice of using natural essences for healing. Aromatherapy incorporates concentrated oil extracts from flowers, herbs, fruits, trees and grasses. When applied directly to the skin or inhaled, the tiny molecules of the oil enter the pores or nasal passage. They make way into the bloodstream and travel through the entire circulatory system of the body as well as the lymph. Essential oils are carried to the area of the brain that influences emotions, desires, memories and creativity. Aroma also stimulates the production of hormones which control one’s physical and psychological functions. 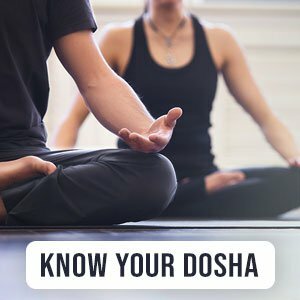 In Ayurveda, the three dynamic forces in nature or doshas control one’s physical, mental and emotional systems. Aromatherapy helps to restore balance to the mind, body and spirit in a natural way by using the aromatic properties of plants. It can easily be incorporated into Ayurveda for its natural take on balancing the energies in our body. Ayurveda recognizes that essential oils can be classified as either warm or cool and wet or dry, and some oils can be neutral in nature. Know the right oils for you by taking our dosha quiz here. Vata dosha is the elemental force of Air and Space. Its properties are light, quick, mobile, irregular, cold and dry. Because of these inherent traits, Vata is balanced by sweet, warming and grounding scents. Vatas tend to feel cold and have dry skin and hair. They are also emotional and can become over excited or anxious. According to Ayurveda, Vata can be imbalanced as a result of poor diet, poor elimination or indigestion. An imbalance is caused when there is excess Vata in the system that leads to drying, loss of tissues and emaciation. A Vata deficiency in the body can aggravate the aging process. The following oils are beneficial for both types of Vata imbalances as they increase digestive fire, increase internal heat, strengthen circulation and flush out toxins: Ajwain (carom seed), arnica, bergamot, black pepper, bay, camphor, calamus, cumin, cinnamon, clove, celery seed, ginger, eucalyptus, lemon, marjoram, nutmeg, orange, oregano, rosewood, sage and thyme. Deficiency of Vata requires herbs that will aid building tissues. These oils could build blood, relieve menstrual cramping, strengthen organs weakened by disease, alleviate poor nutrition, delay aging and strengthen the sexual system: Angelica, clary sage, vanilla, myrrh, tarragon, parsley, rose and jasmine (Note: Both these oils are cooling, so avoid prolonged use). The best carrier oils for Vata are castor, peanut, hazelnut, sesame and avocado. Pitta is the energy of Fire and Water. Thus, its qualities are hot, intense, sharp, light, oily and liquid, which are balanced by using cooling, calming and soothing herbs. Cooling herbs are often spices which improve digestion and elimination by dispelling blockages and promoting energy flow. Pitta uses bile to stimulate metabolism and direct digestion. Astringent oils are drying, while having a tightening effect on the tissues, promote wound healing and stop bleeding: Clary sage, calendula, carrot seed, lemon, St. John’s wort, turmeric, wintergreen and yarrow. Cooling oils to pacify Pitta’s heat and cool the liver: Lavender, lemongrass, lemon, lemon balm, neroli, peppermint lime, neem, vetiver, fennel, coriander, spearmint, wintergreen and sandalwood. Restorative and nutritive Pitta tonics that nourish the cells and tissues of the body, decrease inflammation, build the blood and lymph system, restore secretions, increase awareness, create expansion and change patterns: Angelica, cedarwood, carrot seed, neroli, neem, rose, brahmi and jatamansi. The best carrier oils for Pitta dosha are sunflower, olive and coconut. Kapha is the elements of Earth and Water, having qualities of heavy, cold, slow and moist. Kapha is best supported with warming, stimulating, lightening and drying properties. In the case of a dosha imbalance, Kaphas tend to become sluggish and susceptible to depression. Kapha predominantly forms as mucous in the stomach and lungs. Diuretics are effective in reducing water retention and are important in Kapha therapy. Oils such as ajwain (carom seed), cinnamon, coriander, garlic, fennel, juniper berry, lemongrass, spearmint and parsley are excellent for this purpose. Increasing digestive fire pacifies Kapha, so stimulative essential oils are useful: Ajwain (carom seed), anise, basil, bay, black pepper, cardamom, calamus, cinnamon, cloves, ginger, garlic, juniper berry, mustard, orange peel, nutmeg, oregano, pennyroyal, parsley, saffron, valerian, turmeric and thyme. Diaphoretic oils are useful for eliminating excess water, and they purify the blood and lymph: Ajwain, angelica, cinnamon, camphor, basil, cardamom, cloves, eucalyptus, juniper berry, ginger, lemongrass, oregano, sage, thyme and mugwort. The best carrier oils for Kapha are almond, grape seed and mustard. Tip:&nbsp;You may have noticed that some essential oils are beneficial for more than one dosha. These can be used to create a synergistic blend which will make them all the more effective, economical and enjoyable. Steam Inhalation: Pour boiling water into bowl, add 2-3 drops of essential oil, cover head with towel and inhale the steam for two minutes. Cooking: 1 drop = 1 teaspoon dried herb. (Note: Use only steamed distilled, culinary essential oils for internal use).